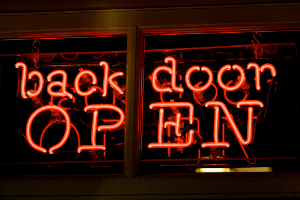 According to Mandiant 83% of all backdoors used by APT attackers are outgoing sessions to TCP port 80 or 443. The reason for why APT, as well as other attackers, are using these two ports is primarily because most organizations allow outgoing connections on TCP 80 as well as 443. Many organizations try to counter this by using web-proxies, which can inspect the HTTP traffic and block any malicious behavior. But TCP 443 cannot be inspected in this way since SSL relies on end-to-end encryption. By end-to-end encryption I mean that the session must be encrypted all the way from the server to the client without having any SSL proxies or MITM devices that break the encryption between the server and client. Inserting an SSL proxy would typically result in a certificate error in the client's web browser. 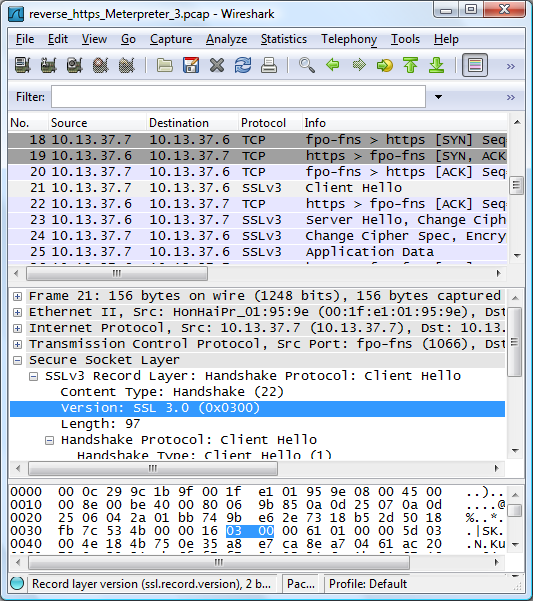 TCP 443 is therefore left untouched on most organizations' Internet connections. Such poorly designed C&C protocols can easily be detected with static IDS signatures, which could simply match on the initial chunk of static data. Jaime Blasco actually wrote such a Snort signature for the "ET TROJAN Aurora C&C Checkin". But what if the attacker uses a proper outgoing SSL session for the command and control backdoor? Such a feature would prevent most passive IDS and IPS products from detecting the backdoor, since the C&C sessions would have to be MITM'ed in order to reveal their contents. The popular penetration testing framework Metasploit was recently extended with support for “reverse_https”. With reverse_https a pen tester can have compromised machines establish meterpreter backdoor connections inside of real SSL sessions. I decided to try this functionality out for myself in order to see if these SSL backdoors can somehow be detected through analysis of the network traffic. So what information could an incident responder or network forensics investigator use in order to reveal that this SSL session wasn't just normal HTTPS web surfing? Well, something that many people aren't aware of is that the initial part of an SSL session isn't encrypted. In fact, there are some pieces of relevant information being transmitted in clear text, especially the X.509 certificate that is sent from the SSL server. NetworkMiner extracts any X.509 certificates from SSL sessions going to TCP ports 443, 465, 563, 992, 993, 994, 995, 989, 990, 5223, 8170, 8443, 9001 and 9030. NetworkMiner Professional, on the other hand, automatically detects SSL/TLS sessions regardless of port number and can therefore extract X.509 certificate also from non-standard SSL ports. I therefore simply opened up some captured network traffic containing reverse_https traffic in NetworkMiner Professional in order to have it write the certificates to disk. From the three loaded pcap files above NetworkMiner also extracted three different X.509 certificates. Notice that the filename of the generated “.cer” file is built from the Common Name (CN), which should be the domain name of the SSL-enabled server. The CN's of the certs extracted from the reverse_https traffic does, however, not make any sense (they aren't real DNS hosts). I therefore used OpenSSL to look closer at the .cer files. All three certificates seem to have randomly generated data in a lot of fields. The CN's of both the issuer and the certificate owner always seem to be in the following format: [RANDOM-DATA].com/gov/net. I also noticed that the validity period of all certificates was exactly one month. None of the certificates are, of course, not signed by any trusted CA (just as the case was with the TOR traffic I found in Richard Bejtlich's sample lab). A more general approach would be to monitor all network traffic for certificates that are not signed by a trusted CA. Doing this would, of course, generate a lot of false positives, but I still believe it could be an effective part of a “Defensible Network Architecture”.